The Rockford Blog explores political and cultural issues past and present in Rockford, Illinois. We have rescue missions, food pantries, and treatment centers for the mentally ill overrun with those who need help, and The Rockford International Airport thinks their mission of greeting visitors to Rockford, Illinois, takes precedence over all that? "...must work cooperatively and courteously with diverse groups of people; be able to access multiple references in a timely manner in response to customer requests for information; demonstrate oral and interpersonal communication skills, and have the ability to respond calmly in emergency situations. A basic knowledge of the internet or the ability to learn basic computer skills is necessary. The ability to travel to/from the airport in all types of weather conditions is required..."
To paraphrase Helen Hunt in As Good As It Gets," seriously, Rockford, the mayor's office, Chamber of Commerce, and Rockford Area Convention and Visitor's Bureau, "Do you have any control over how creepy you get?" What evidence do you have to suggest that volunteerism is the major cause to the problem? You have ignored my comment. What makes you think that it's volunteerism? Where is your data? Good enough. The Chicago-Rockford airport is a fair example. It would be nice to see further data on this. I remember an RVC sociology professor back in 2005 or 2006 at Rock Valley College consistently talking about how Rockford, Illinois is a great place to live. LOLOLOLOLOL. That is absolutely laughable. I personally think him and his wife got high on marijuana back in the late-2000s, as I would see their eyes bloodshot (perhaps it wasn't marijuana but instead was "hard work"). The guy was a real prick, too. I don't doubt that voluntarism may be a healthy thing for ex-convicts who need to regenerate their credibility, work ethic, and references for a job market. Before I left Rockford, IL in 2009 for Chicago, IL, I recall that Winnebago County built that jail house west of the courthouse. That could have been used for prevention programs. Now, there are drug prevention programs and all kinds of ridiculous things, because Rockford, IL went down hill. Some forms of voluntarism, as I've experienced, can be a useful way to gain skills. 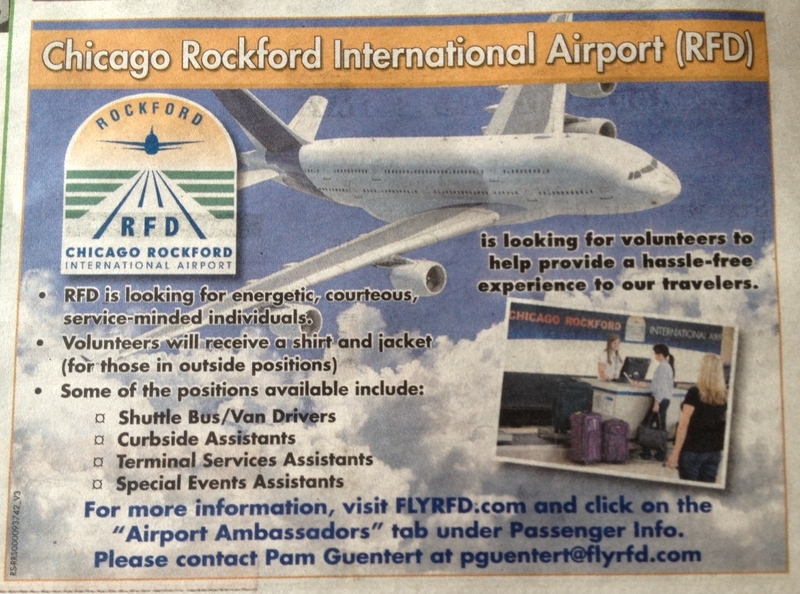 However, for jobs, such as those listed by the Chicago-Rockford airport advertisement, those are jobs that you would pay people for. The skills acquired are almost meaningless, thus leading to minimum wage jobs in the end, anyway. Well, maybe not a bus driver; but otherwise, yeah, min. wage jobs. It would be great to see more things about the Rockford, IL economic politics. I don't think enough people are talking about the economics of Rockford, IL. However, I think sensible people have enough intelligence to leave Rockford, IL as fast as possible. Scott Lively Charged With Crimes Against Humanity. What Is the Rockford Institute? You Only Brought a Taser, an Ax Handle, and Brass Knuckles To a Fist Fight?